1. For professional coaches the answer is easy and simple. You place the MOXY on the same place as the placement of the SEMG electrodes. These are used since over 1/2 century, so most coaches are very familiar with this placements and there are great guides out there for basically all sports and more localized activities. The limitation is similar, as you have to have a direct surface to muscle contact due to penetration depth. ( example a gluteaus medius or minimus can't be tested or any of the deeper rotatores like gemelli , obturatorius and the famous piriformis ) So coaches like cycling coaches , cross country coaches, running coaches, swimming coaches have therefor a very easy task to place the MOXY. We put the MOXY in a small plastic zip lock bag or wrap it in cellophane wrap. If we test in extreme light and the MOXY is not covered by clothes like bike shorts or any other cloth we use a small piece of the 3 M Vet Rap ( Latex free) to cover over the MOXY to get rid of risk of light. Any small black piece of cloth will do it. We never as of yet had any problem or lost a MOXY even under the most extrem conditions like during an ice hockey game or a soccer game in rain or even during swimming . Last week we even tried it on a local wrestler during a fight and we had it placed on a hamstrings muscle and on an upper trapezius muscle. I can recall a short feedback on here somewhere, where the person had some problems with attaching it and I do not know what he used . ( So please come and ask and we can try to solve a problem instead that every body goes to the starter problems. We play with this since many many years in all different sports so lot's of practical experience and solutions. Not optimal is, if you use a wrap around and or any kind of compression sleeves for forearm or legs, as it can influence the tHb and as such some results. 2. Now there are some thoughts to the placement. a) Are you interested in the systemic reaction in a sport activity, where lot's of muscle mass is involved. 2. Or are you interested in more local reactions unilateral or bilateral. If you look for SmO2 trends and tHb trends for systemic feed backs, you place the MOXY on a muscle group which is not involved in the actual muscle pattern for that sport or only very little. If you are looking for local trends you place the moxy on a muscle which is one of the main muscle groups for this particular sport. As coaches and or as training centers we suggest using at least 2 ,optimal 4 MOXY equipment. Yes the question is cost. My answer : How much do you pay for a decent VO2 test equipment ??? What do you get out of this information. How much do you pay for 4 MOXY's ?? and what do you get out of this information. Which of the 2 equipment's can you use as well for a workout or during a race ???? Which equipment can you use for strength workout , quality control during a strength workout. Planning and controlling interval loads and sets and rest periods. Comparing left and right trends or involved and less involved feedback. Which one does not need any replacement after a while like a O2 sensor or a CO2 sensor or some new masks . Which one needs very little cleaning and no risk of contamination.If you have 4 moxy how many people could you test at the same time with similar or more info than with one VO2 equipment ? You can give the answer as it is NOT a test. So here some placements and some thoughts to it. Speed skating: Quadriceps vastus lateralis. if more MOXY's available both legs as certainly in short track there will be in many athletes an actual structural difference between inside and outside leg. And as well one MOXY on a not involved or minimal involved muscle. So if you choose an arm muscle take the insight arm delta pars acromialis. Cross country skiing: Skate skiing. Vastus lateralis left and right and an upper body muscle ( triceps ) if you do not look left and right get a Vastus lateralis, triceps and intercostal muscle 7/8. Downhill skiing vastus lateralis left and right and rear delta. Ice hockey vastus lateralis higher than in skiing ( ( covered by pants) and any upper body muscle like rear delta or triceps. Soccer : vastus lateralis and any upper body arm muscle and intercostal. Handball and volleyball vastus lateralis and any upper body. Tennis and badminton :vastus lateralis and intercostal and any arm muscle on the dominant arm side. Running: Vastus lateralis and delta pars acromialis and intercostal. Vastus laterlais left and right and delta pars acromialis . Not optimal again is the calf muscle due to changes in techniques with heel drop and or toe push as well as cleat placement. Cycling in the flat often can change the ankle activity versus cycling on a hill or out of the saddle. The calf muscle has a very strong variation in tHb and SmO2 in this port when you look in the field. If you have any other sport in mind please mail and we can have some suggestions on where an how to place the MOXY and why. Have a great time with playing with your new toy and come back with information and critical questions. For climbing I would consider doing a baseline; Using 2 on upper body and 2 on lower body to see weight distribution of climber's effort using face terrain with large holds. Being able to measure simultaneously may limit measuring non-used muscle. From there I would consider forearm and tricep for upper body and calf/quad for lower body. Ideas to expand the test for different climbing styles; For a crack climb, might consider placing on forearm, calf and opposite quad. Would also be fun to compare Sm02 response if the climb had a long approach or hike before reaching the start of the climb (low Sm02 to start?). Could utilize a treadmill TIP test to assess the climber's Sm02 response to hike with/ without weight of a pack. I attached the VersaClimber study we did last April to show how a full Moxy TIP could be completed while focusing on sport specific parameters. This post created a lot of great feed backs and suggestions but as well some very intriguing points to discuss. 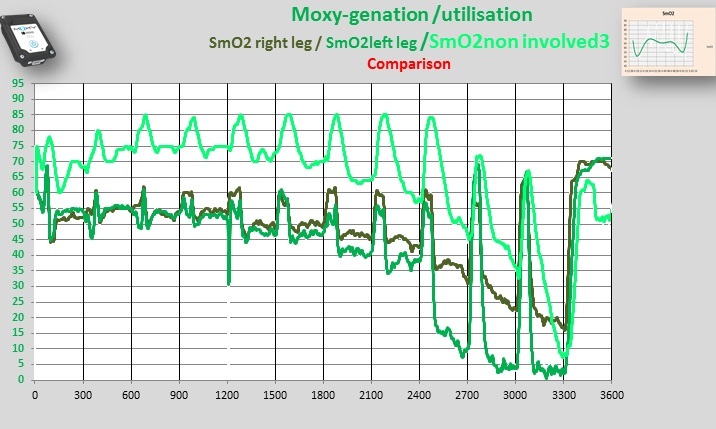 First some critical points to NIRS/MOXY. It is a super great direct feedback live from your delivery and utilization situation in your assessed area. This means we now what happens in your assessed are and can make some conclusion's based on what may change the delivery and or utilization in your assessed area. You see ,what I mean. I can have an ankle in a cast and still bike and I can have a MOXY on the other calf muscle and I can tell you what happens in the calf , where the MOXY is in. That's it . I can't tell you whether the same happened on the other side. True this is an extreme situation but it proofs the point.So I can run or ski or bike and I can have a MOXY on a calf and a quadriceps or a moxy on a hamstrings and a quadriceps. Both will tell me hat may have caused the change in utilization an delivery. This may not happen at the same time. 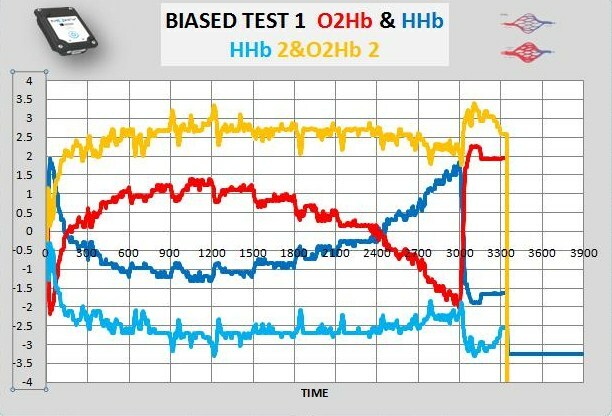 So if people do research , looking for a break point or threshold on a NIRS trace like O2HB or HHb or SmO2 in the moxy case, than they have to do this searching for a BP on different muscles to be sure, that lactate trend really fits together with all BP from all different muscles. So if I compare a O2Hb or HHb or SmO2 on the calf and on a quadriceps in any sport but let's stay with biking and running, than I will have the BP on different intensities. a) involvement of the muscle in the overall performance. A fore foot runner has a much higher calf involvement than a heel striker for example.
. b) the muscle fiber composition of calf and quadriceps are very different as the calf has much higher STF % and one of the highest of many muscles in the body. 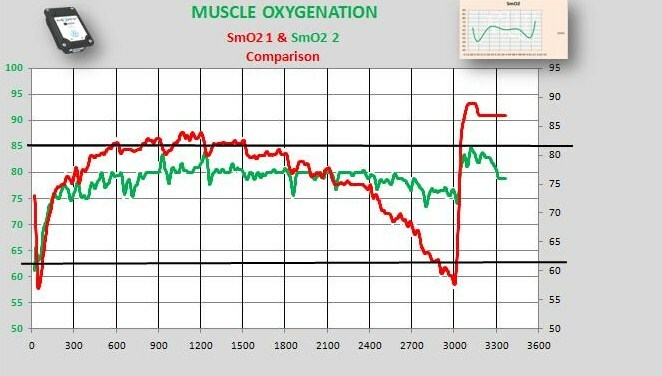 So the ability to utilize O2 in the calf is very different than in the quadriceps and as such we have a much earlier change in H + concentration in the quadriceps than in the calf. If we add the higher % of involvement for the activity to it , we will have a much earlier shift of the O2 diss curve to the right and as such a much earlier drop in SmO2. Here an example form a Cross country erg assessment. The RF is the quadriceps and H stands for hamstrings. The regular reader can see, what the delivery challenge was of each of this muscles and it is very different. So the chance, that both contribute the same amount of lactate to the system is ????? So making a conclusion on a systemic collection of lactate and who of this 2 muscles may have contributed to the appearance of lactate in your finger is a long stretch away form any save conclusion.
. The lactate we normally test is a summary of lactate production and removal and left over form somewhere in the body produced in excess from some muscle groups and not used as much form other s and than it may show up at some times after it all happened. The protocols we choose will create a calculated speculation with a very uncertain outcome. What is the time we test and step length and so much more. It is unreal that we believe this is accurate and validated and what ever we complain about accuracy. Now why all of this. I got a mail with this section which is as it looks form a discussion in this direction. I do not know how they all do or did this so I can be very wrong or missed some very great step forward n lactate testing. @ Stephen, our initial testing was completed on both the thigh muscle (vastus lateralis) as well as the calf muscle (gastrocnemius). Both of these muscle groups are engaged significantly during both cycling and running. Both produced strong, measurable lactate responses. We ultimately chose a calf solution as our first model based on the results of end user A/B testing. To accurately measure LT, the device must be placed over the calf muscle using the included compression sleeve as this is a major muscle group involved in the exercise. Hope this answers your questions!
" Both of these muscle groups are engaged significantly during both cycling and running"
That is true and if we run in the field they even change the w way they support us. So uphill running will change the % of calf involvement compared to the down hill running for example. Sitting on a bike in different positions will do the same. The fact that the fibers are very different will create a very different NIRS trend and BP and as such we will have a problem to know , which muscle contributed to the increase of a classical lactate curve. That is amazing if they actually where able to test independently the lactate production in the calf and the quadriceps . Than actually see the same NIRS reactions despite the points above and even more extreme that the lactate production w in both muscles would actually be the same level as they increase load. 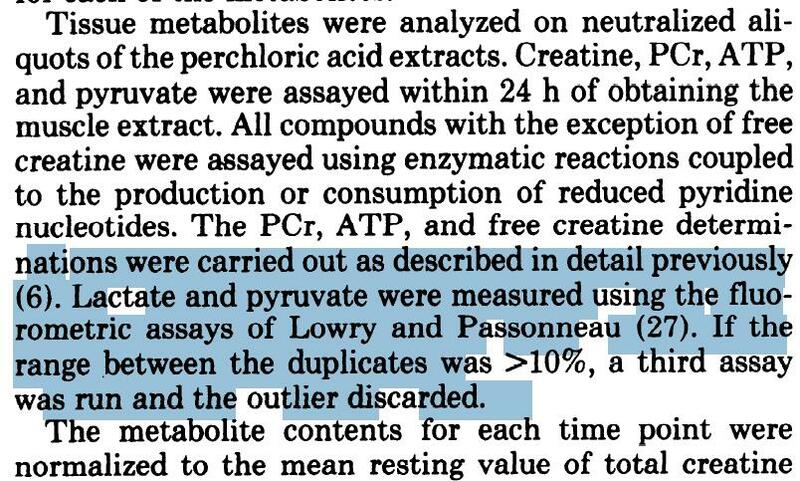 So if they were able to actually test the lactate production/ utilization and release to the systemic blood individually, than they are a huge step ahead of what was done and for sure, when they where able to do this in big enough numbers so the result has some statistical values.. If they use a simple hand held lactate analyzers , than the statement is going up in smoke. Summary. 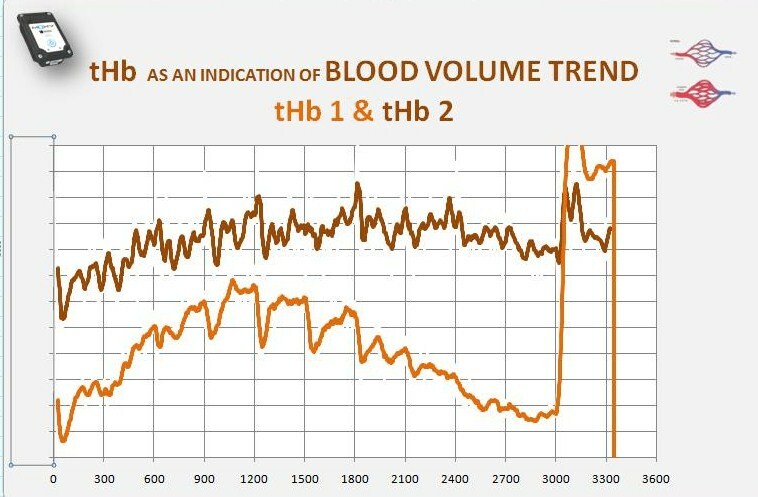 We do not think , that it is possible to take a O2HB and or HHb trace from a muscle and compare this with a systemic lactate reaction due to the fact , that one is direct information and the other ( lactate ) is an indirect speculation to say the least. Again, we may have to at least start to discuss and late perhaps accept the fact, that lactate today is not what it suppose to be many years back. If we accept the lactate as a very great transporter ( carrier and buffer support and energy delivery to name some advantages , than we may have to go back and review ideas like workouts to create a lactate tolerance.. Why would there be a need to learn to tolerate lactate in fact some great research suggests, that supplementing a muscle activity with lactate will allow the performance to be strong for a longer time. I am sure we will be back on this ongoing discussion. We simply think , take NIRS for what it is a great direct feedback for local and in some cases for systemic reactions and let's work that way look what we see and combien existing informations with the new data collections and be open for some hard questions. The same old questions of the classical idea, that O2 is not involved in short term activitis like 100 m sprint or weight lifting or jumps in figure skating. ???? Got some nice mail back on that. The content in one sentence. Proof that you really will see a difference between left and right calf or other muscles.
. 1. There are very few people , who are absolutely even with their ability of coordination or strenght. There are some sports where we are actually incredible asymmetric like shorty track speed skating, or rowing in an 9 men rowing boat. , but even in sports who look symmetrically we may have much more asymmetric reactions than we think. Here an assessment on a top class cyclists of his left and right leg , testes d during our Seattle seminar a few weeks back. 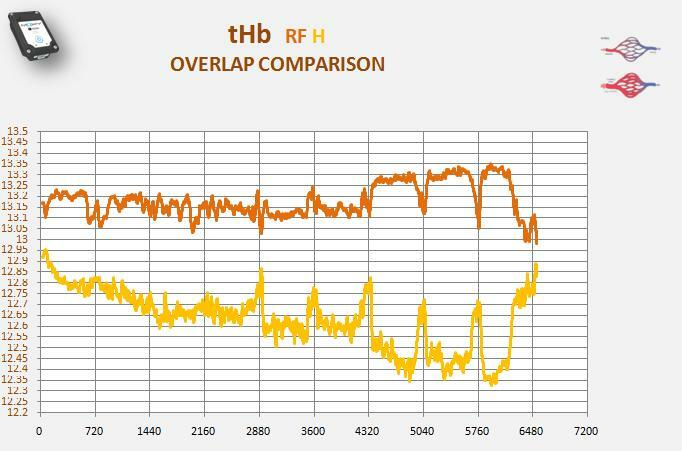 Now here nice example sent to us from a cycling test where we looked at NIRS information right and left calf muscle. Now what would be nice is to see some data from the e mail writer , where he can show absolute symmetric reactions in SmO2 and tHb or HHb O2Hb with their ideas and than we can move the discussion n a fair field. We than can even combine the idea, on how we know, which Break pint from which leg first to the systemic lactate curve . Than we can follow up an discuss , why the curve only fits when we have a 33 min step versus some other protocols. Here what I mean . 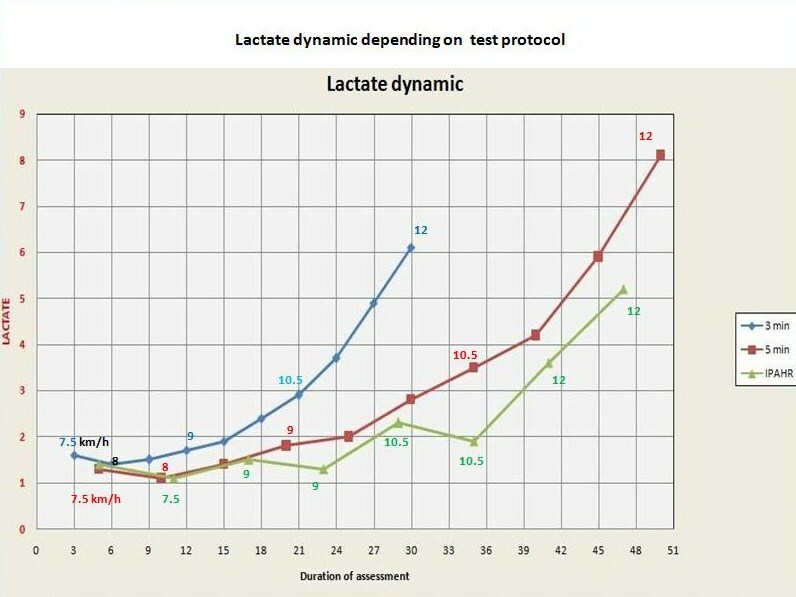 3 lactate curves f taken on the same person. Which one suppose to show us the lactate threshold . ? The performance ( speed ) was the same as was the treadmill and the incline the same, Same time of the Day and a same amount of rest days in between. 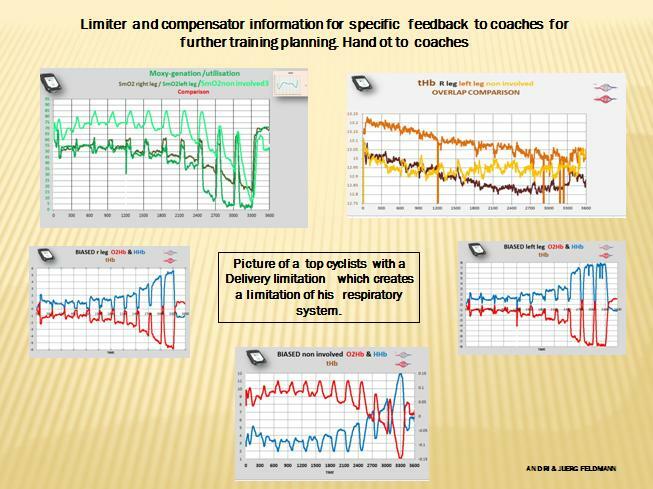 So we simply where looking at the lactate values by the same speed with different protocols . You give us the feedback on what and which is the proper lactate threshold . I see here missing guide where tu put Moxy for different sports. Well I tried to get data form RF when running, all good. VL would be good as well. But where I struggle is calf, where when running the data are not displayed correctly. Could we create a pool of photos where to put moxy for different sports? @jankubes it has been suggested elsewhere in this forum that the calf is not a good place to put the moxy as the incline you run on changes the stress, compression, etc even when the relative intensity is the same. Hi, I know (https://www.youtube.com/watch?v=c1kTxZb0zEY) but if there is any "guide" where to post it. It would help athletes, cause they dont study anatomy...photos?